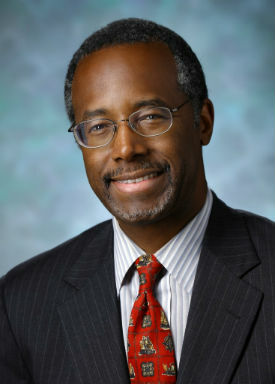 Dr. Ben Carson, MD is a rising GOP star. In a recent online poll by newsmax.com, he was running a close race with Ted Cruz and Rand Paul. Recently, he’s made the obligatory comparison of America to Nazi Germany and also the customary ridiculously hyperbolic condemnation of Obamacare, so you know he’s serious. So, how do we assess this Ben Carson? Intentionally giving syphilis to rural Guatemalan men and withholding treatment from infected African-Americans to study the effects of the untreated disease. Giving money and weapons to tyrants in Chile, Iraq, Saudi Arabia, Nicaragua, South Africa, etc. Making rich people subsidize health care for poor people. So maybe Dr. Carson overshot a little. This is how you court the far Right, I suppose. Except that Carson also thinks the United States is similar to the Third Reich in that people are afraid to speak their minds in our “Gestapo state.” I guess we take this to mean that there are even more radical things Carson would say if not for the threat of government retribution. As curator of a website documenting Republican stupidity, this makes me desperately curious. If these few statements are any indication, I think we can safely conclude that Dr. Carson’s verbal filter is completely broken and he just says the first thing that comes to mind. For example, he recently stood up for Condoleezza Rice by asking, “Where are the black liberals when atrocities occur?…Organizations like the NAACP, do you ever see them coming out in support of a conservative black person?” The “atrocity” in question was a protest by students and faculty at Rutgers University over the selection of Condoleezza Rice as commencement speaker. The objection by the protesting students is that Rice was a public supporter of torture by the US government and lied to the American public about weapons in Iraq and is not someone they respect or hold up as an example. Now, it’s true, the NAACP didn’t come riding to Secretary Rice’s rescue, but they are quite busy. They agitate for policies to curb predatory lending, voter disenfranchisement, stand-your-ground laws and racial profiling because these issues disproportionately affect African-Americans. As soon as academic backlash against high-ranking former state department officials at graduation events begins to disproportionately affect black people, I’ll expect the NAACP to jump on that as well. But, you can’t lie to people to send their sons and daughters to war and then blame it on racism when they don’t want to listen to you any more. And, in fact, Secretary Rice is still scheduled to speak, so it’s hard to see what exactly Carson expects from the NAACP, the first amendment being what it is. So, like the parade of African-American darlings of the GOP before him (Allen Keyes, Thomas Sowell, Herman Cain), Ben Carson is no less crazy for being Black. The looniest thing about these episdoes that I don’t find these examples on MotherJones or AlterNet. They’re not some unguarded moment captured on someone’s phone. These are positions proudly trumpeted on conservative sites like Brietbart and Newsmax. The White Right seems sure that if they would just be freed by the PC police to say all the racist things black conservatives can say, that the country would wake up and accept their vision for America. Well, speaking from the Left, I vow to do anything in my power to give voice to these types of authentic conservative views on race in America. Republicans, how can I help? Update! Eric Holder, black attorney general of the United States, recently cancelled plans to speak to graduates of an Oklahoma City police academy due to protests. So far silence from both the NAACP and Dr. Carson. Previous article Democracy leads to tyranny of the majority. We are a Republic!